The changing face of Ethiopia. The US elections are over and I have not met anyone happy with the outcome. All the dirty linen was washed in public and the winner was the one with the most stain. The opinion polls malfunctioned spectacularly. I followed the election process as told by what is called the ‘liberal’ media. Huffington Post, Slate, The New Yorker among many convinced me it was going to be a ride in the park for Secretary Clinton. HP even gave the Democrats a 91.5% percent of winning the Presidency. In case you forgot the Donald won bigly. It is almost a week now and things are sort of returning back to normal, if there is such thing as normal anymore when you have the Donald in charge. How fast the Donald learns the awesome responsibility of being The President is the talk of the town. The Democrats are licking their wound but the Republicans have a leader that is indebted to no one except his ability to con. I am sure the Republican leadership is afraid of him than they are of the Democrats. God help the human race is what I think. Ethiopian Americans mostly if not all supported the Democratic ticket. I am always envious when my family and friends vote. It is a source of wonder to think an Ethiopian upon Naturalization can participate in choosing the most powerful office holder in the world. That same Ethiopian is not trusted or considered mature enough to make a choice of who leads him/her when at home. The Tigrai based regime has turned the civic responsibility of voting into a farce. It is also a little strange to see a few Ethiopian Americans that participate in the voting process when over here pretend not to notice when the regime they support and coddle denies that right to their cousins back home. 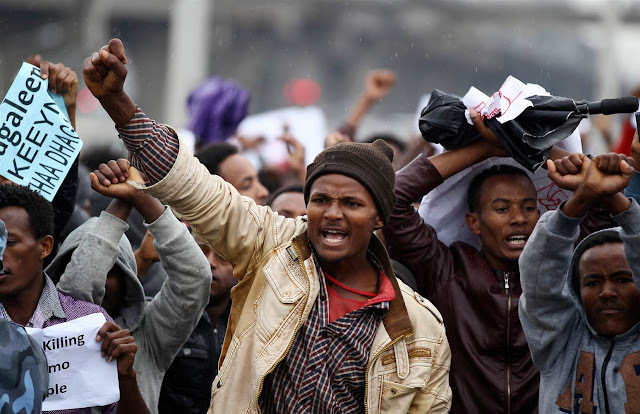 Democracy and rule of law are in short supply among Ethiopians. Currently even that little semblance of ‘emerging democracy’ is put aside. Today Ethiopia is being ruled by the troika of Samora, Abay and Debretsion with Abbay Woldu the Tigrai warlord and Security chief Getachew playing a supporting role. The new organization they have created named Command Post (it is true, not a joke) has openly admitted to have arrested eleven thousand five hundred citizens. It has named six mass prisons (concentration camps) in Yirga Alem, Zuai, East Harerge, Bahr Dar and Tolay Military camp where the young people are kept. We are one amazing people. We have traveled so much but we have come back to where we started from. We got rid of the Monarchy to replace it with a Military Junta that gave way to Ethnic laced pseudo democracy and today we are back to Military Junta in charge. The illegal act by TPLF Party which supposedly is one of the members of the EPRDF coalition to have its own Army and kill and detain citizens from a different Kilil could be considered a little bizarre by a foreigner but believe me we Ethiopians have the capacity to explain it or the discipline to ignore it. Eleven thousand five hundred young people in detention camps, over fifteen hundred killed in Oromia, thousands more in Amhara, Konso and other Southern regions are numbers we are familiar with and they don’t even evoke anger. The more harsh our rulers are the less resistant we become. We have become desensitized to mental and physical violence by TPLF thugs. The election of Trump seems to upset us more than the thousands that are corralled in concentration camps like animals. The Oromia region has been the epicenter of the war between the people and the TPLF controlled Army. Thousands have been killed. We do not know exact numbers because no independent reporting is allowed. The conflict moved to the Amhara region three months back. It has resulted in more loss of life and property. The current upheaval is different from all others before. The last few months the alignment of forces against injustice has showed a remarkable shift. The two most populous and largest groups have realized the virtue of coordinating their activities against the common enemy and have formed a Movement to start the process. Please notice the current conflict and mass arrest is not applicable to the Tigrai region that is enjoying the fruits of freedom. Thus the war that was started by the mafia group with its land grab in Addis Ababa and the redrawing of borders in Wolkait-Tsegede is still raging each in its own peculiar way. The damage to Oromia is extensive. The killing has been wide. On the other hand the resistance has woken up plenty. The Amhara region engaged woyane army not long ago. Bahr Dar has been hit hardest. Many are convinced the conflict has entered a new stage. All indications are the Woyane economy is showing plenty of stress. At home it is denied raw materials from both Amhara and Oromo regions including the South.. The ongoing unrest has disrupted farming activities. Transportation has become a hazardous business. Be it Selam Bus or Dashen Beer or Cement and timber carrying trucks the Ethiopian roads are turning into battle fields. That is one aspect of the struggle for Freedom. Tourism has taken a nose dive and the regime is scrambling to pretend all is well. Many have cancelled planned visits. Ethiopian Airlines the Woyane playing toy could be next to feel the pain. The Diaspora is afraid to travel and is shamed from investing in Woyane land. The military ventures deep in Amhara and Oromo homeland is a costly enterprise. The solders have to be fed and paid while facing hostile population and subject to ambush. Perseverance in the pursuit of freedom determines the winner. The regime will soon display contradictory behavior. It is stretched thin while Inflation, unemployment, and government spending are destabilizing the weak economy. What is needed here is tightening of the screw by the Democratic forces. The unity among Ethiopia’s children is what is giving many hope. Unity is what will undo the mafia ethnic group quest to stay in power a day longer. When the Amhara feel the pain of the Oromo and the Konso feels the pain of the Afar and the Sidama and the Tigrai show empathy to the plight of the Gambelan-that is when ethnic mentality disappears from our land. We are moving towards that. I have not seen many that stand strong when alone. Together is the way, especially in our country where the mixture makes us look like a salad bowl. I am sure the future generations will mix it up some more and even bring more diversity from all the places in the world we have settled. This is the perfect moment to get rid of village mentality. Thinking in terms of a Nation to be forged standing on equality is a better challenge. The Bantustan model attempted by Meles is not sustainable nor visionary so why copy failure? That is what is surprising about our country. Everytime we have the TPLF on the ropes there emerge some from our midst trying to reinvent the wheel. They insert their confused and useless philosophy of ‘ethnic’ yellow card into the mix. The last forty years we have been watching the trials and tribulations of our Oromo leaders trying to define the Oromo struggle in their own narrow and dysfunctional way. It is always sad to witness the so called liberators cause untold damage to the constituent they are supposedly trying to free. It was also disheartening to watch the Woyane group playing them like a fiddle inviting and disinviting them in the same sentence. What is giving us hope today is the fact our Oromo cousins have come to realize our fate is interwound and one section of Ethiopia can not be free without all Ethiopia being free. Experience is the best teacher. We now realize that there is nothing like having a big family. So we thought we have jumped over that hurdle and we started to look forward to taking our struggle onto to a higher level. Please hold on, things do not work like that in Abesha land. Travelling in a straight line is not our cup of tea. Today we have some in the Amhara group trying to emulate the old Oromo method. They have not gone to the deep end of ‘Independence’ yet but they have stepped on the slippery road and all it takes is one unhinged ethnocentrist to sit behind the wheel and drive the bus off the cliff. The current TPLF regime has been in power for twenty five years. One thing you can say about our Tigrai masters is that they are an equal opportunity abuser of all of Ethiopia’s children. They have driven the Gambelan off their ancestral land, grabbed Oromo land bigger than Tigrai, starved and pushed the Amhara to be refugee in his own country, committed war crimes to punish our Somali people on behalf of foreign powers and used the south as their backyard and destroyed the people and the environment. Any Ethiopian claiming to have suffered more than another is just playing a numbers game. Settle down my friends Woyane is focused on all of us. While the abuse was going on Ethiopians in the Diaspora did not look at ethnic origin when they went out protesting and marching in all the capitals of the world. We cried when the Gambelan was hurt we shouted when our Amhara people were pushed out of Gura Ferda or Benishangul, the war on Waldeba monasterybecame a personal attack on all Ethiopians, the war on our Muslim citizens was unwarranted and we stood together and the Addis Master plan to confiscate Oromo land held our attention. We Ethiopians came out regardless of ethnic origin to protest injustice against our people. So what is this scramble by our Amhara family to form a new organization every few days to draw maps and define our country from a single perspective. Why is it when associations based on ‘ethnicity’ as a core value did not work when it was tried by others (Oromo) or caused much damage when practiced by some (Woyane TPLF) what makes you think it is a brilliant idea this time around? I have noticed the ones that come up with such zero sum proposals have usually tried and failed to create a vibrant inclusive associations working with the many. In the marketplace of ideas one has to compete with not only being an expert in a certain field but show respect, difference and develop the ability to bring diverse groups together. The people decide who wins and who has to go back and revise their proposal and outlook and come back. It is a tall order to try to please the many but real leaders have the ability to do just that. Abraham Lincoln plunged his nation into a civil war because he believed preserving the Union was primary and that is leadership with a price. Madiba Nelson Mandela was a patient leader. He knew good would always prevail over evil and bid his time. He was also a magnanimous winner. Reverend Martin Luther King saw the alignment of the forces and chartered a winning road at a small cost to his people. He was a smart leader. Chairman Berhanu Nega of Arbegnoch Ginbot 7 is such leader. He studied his people and drew some important and correct conclusions a long time ago. He has been implementing that vision and it is bearing fruits. Starting with his teaching career, the Kinijit years and the birth of Ginbot 7 he has shown qualitative leap in his organizational skills. His quiet style has served his organization and our country very well. Leadership is earned. It is the wannabe leaders that are always draining our forward momentum. Like a shooting star they show up bright and dazzling but their own brightness consumes their minuscule energy. So when the majority refuses to listen to their baseless trash talk they get miffed and put up a little ethnic tent on the side of the road. Of course they are the brightest light in their little Gojo. Becoming what you hate in others is what comes to mind when confronted by folks cursed with blurry vision. They do not seem to grasp that we Ethiopians are not good at forming ethnic based organizations. Why it worked for the Tigrai group will make a good study. There is light at the end of the tunnel. The situation back home is moving in a very promising direction. Today we are all feeling empowered by the coming together of our Oromo and Amhara cousins attracting the Afar and the Sidama into the fold. It is undeniable proof our Patriots are doing the job in a scientific manner. Our smart leaders are dismantling the feeble system one step at a time. It is surgery without anesthesia. Good luck evil Woyane. The coalition being built is not meant to look good from far like Woyane condominiums but is constructed on the bedrock of trust and goodwill. All Ethiopians congratulate the visionary leaders that put faith in the virtue of working together. It is a big win for our country. That is what all leadership is about. We are especially grateful to Chairman Berhanu of AG7 and thank all the leaders of the Oromo, Afar and Sidama people that choose unity. This is another aspect of our struggle. Building a ‘Free Press’ for the future Ethiopia is one of the primary tasks towards winning freedom. ESAT is becoming a proven asset that has survived Woyanes onslaught. It is further proof that it is all about credibility not about unlimited budget and resources like Woyane employs in the pursuit of telling a lie. ESAT is showing how to use one’s scarce resource in a very prudent and responsible manner. Today ESAT is beating Woyane mouthpieces by a mile both in credibility and quality of programming. That is another aspect of the struggle for Democracy and Freedom. It is clear the little things we have been doing are adding up to be one big thing. That is how a successful movement is built. Now if you are interested in a big ‘look at me’ type of action I am afraid it is not going to happen. That is unless of course it is called for. Circumstances determine that. For example the recent murder of a member of Parliament from the Amhara region is very troubling, what does it signal? What we see here is a war of attrition. The opposition is working to wear down the Woyane mafia that is used to employing overwhelming force to make a statement and make us question our ability to fight back. That saps our morale and we disperse easy. It is easy to win small battles but one can not win a war in such manner. That is the reason we are frustrating the enemy in many different ways. Political, diplomatic, economic and grassroots organizations are being employed to effective results. We already have forced the regime to reassess its relationship with our people. It was forced to shed crocodile tears but this time no one bought the drama. We are writing the agenda today and we ask a few to kindly do whatever they feel compelled to do but leave us alone and aim your fire a different way. Slandering those in the unity side only gives heart to the common enemy, that is of course assuming we are on the same side my friend.